BEIJING, Sept. 30 (Xinhua) -- President Xi Jinping Sunday called on the nation to learn from a cabin crew known for their expert emergency landing of an airliner. Xi, also general secretary of the Communist Party of China Central Committee and chairman of the Central Military Commission, invited nine members of the cabin crew of Sichuan Airlines to a reception held Sunday celebrating the 69th anniversary of the founding of the People's Republic of China. The airliner of Sichuan Airlines carrying 119 passengers made an emergency landing after the cockpit window broke on May 14. 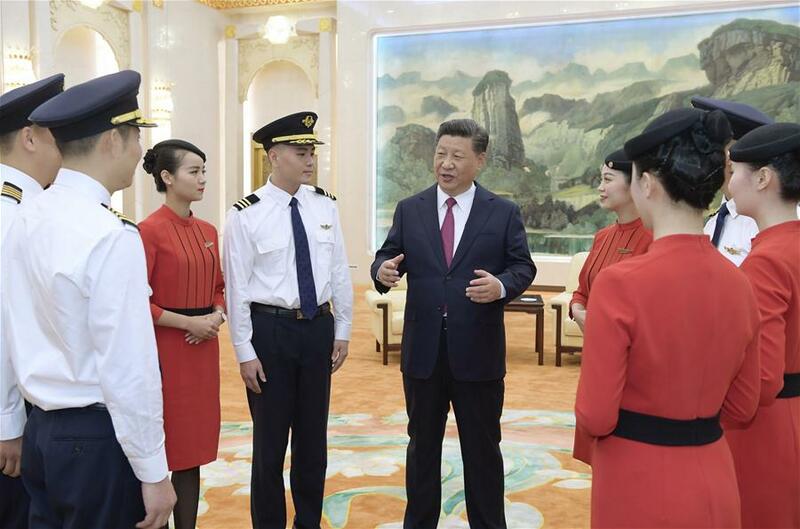 At the meeting with the cabin crew ahead of the reception, Xi called on the whole of society to learn from their heroic deeds, particularly their loyalty, commitment, political integrity and professional ethics. "The purpose of learning from the heroes is to apply their spirit in everyday work and demonstrate a strong sense of responsibility to people's lives and safety," he said. Xi also stressed that safety is the lifeline of civil aviation.